I've always associated culottes with romance, picnics and summer! I didn't think I could pull them off with my small stature, but I was pleasantly surprised! These culottes from TOPSHOP fit really well and have a great length to bare some leg without making me look like I'm wearing an apron too low! I love the simple floral pattern, with its bold yellow and green against the backdrop of white. With my sand-camel faux leather jacket from HOTWIND, it softens the look a bit. Let's not forget my favourite pair of shoes from OFFICE; I am extremely saddened by how the platform is getting worn down! Are those easy to repair? For those who know me, I'm generally quite low-key with my accessorising - I just paired this outfit with a statement ring. 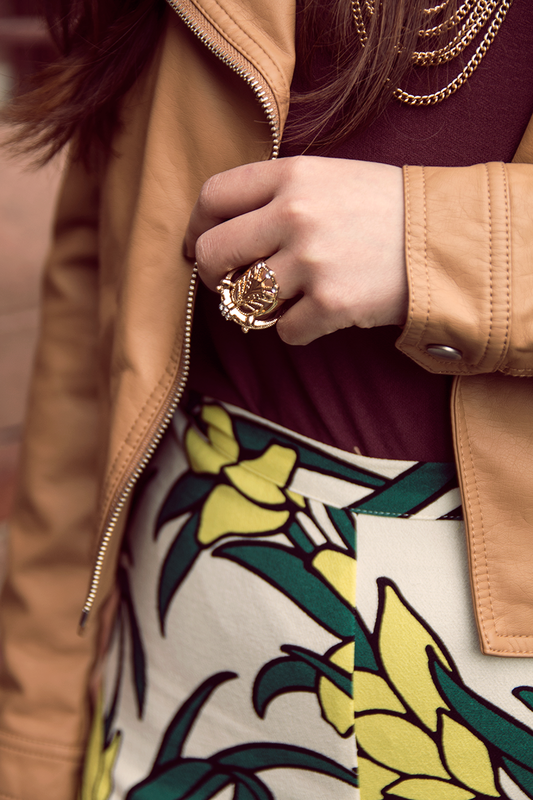 Oh, statement rings. I seriously love them! The only thing is, I'm sort of on a mission - I want to find a ring that won't rust or get dull in colour so easily without spending a fortune. Any thoughts on brands stocked at Candeza? I'm always passing by like a magpie eyeing the gorgeous pieces but not sure how long the wear I'll get out of their jewellery will be! 2 comments on "CRAZY 'BOUT CULOTTES"
This look is perfect! Adore this pants and the way you combined it!